Have you ever thought about what you’d name yourself if you could choose your own name? I was watching the movie Big Daddy with Adam Sandler the other day and I chuckled when he asks the kid if he likes his name — Julian — and permits him to choose the name he’d like to go by. Frankenstein. That’s the name he chose. And it’s awesome. Jenny to my extended family when I was little. In my younger years, Jen among with friends. 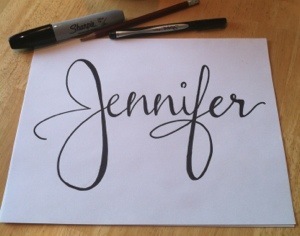 I later decided another “n” was needed, thus Jenn. Jenny again to my nieces and nephews. Jennifer to Mumbles, and of course, officially. How peculiar it is that I don’t identify with Jenny or a Jen with one “n.” But I don’t. And, while I loathed being a First Name Last Initial (“Jennifer S.” back then), sometimes that wasn’t enough of a differentiation and I had to be called simply by my maiden name (which I adored). I can’t pinpoint what I would’ve liked myself to be called if I could choose, I only know that it would be something not as popular as Jennifer. However, I should end by saying that I find it completely endearing that my father knew I’d be a Jennifer before my parents even knew I was a girl, and that growing up Mumbles admired the name too. What about you? Do you go by something other than your given name? Or, if you were to change your name, what would it be?